One of the fringe benefits of travelling is getting used to alternative forms of transportation while simultaneously losing my dependency on driving. North America aside, it seems the rest of the world generally embraces public transportation, either due to to good infrastructure or population density. I remember last year, my trip from Bangkok, Thailand to Siam Reap, Cambodia unraveled like this: walk to light rail, light rail to bus station, bus to border village, tuk-tuk, walk across border, mini-bus to main bus terminal, discover that no buses are running and take a shared taxi to Siam Reap, tuk tuk to hotel. Every time I return from abroad, I find myself going through this car de-hiberation ritual: remove the wheel chocks, inflate the tires, flush out critters that have found a home in my car, cross my fingers as I boost the engine, clench my teeth and shudder as I hear the ball joints creak to life with the first inches of movement. I should probably finish with serving green tea to complete the ceremony. I then hop back on the roads and marvel at how different North American traffic feels. The high-speed. The sudden rush-hour congestion. The wide-laned highways and roads. Granted, driving feels much less harrowing here than in other parts of the world, but probably because I’m used to it. Likewise, a Peruvian taxi driver told me once how he almost soiled his pants trying to merge onto a fast Californian freeway. As for myself, I’ve never quite gotten over how fast 60 km/h (40 mph) feels like when rushing through a narrow Cusco street packed on the sides with bustling locals like a New York subway platform at rush hour. Nor have I gotten used to the discomfort of pushing my way through the middle of a Burmese road market in a motorcycle. For the latter scenario, my polite Canadian nature always feels somewhat sumimasen*, even though the crowds seem to naturally disperse around my motorcycle like the parting of the Red Sea. Above all, one thing I notice is the hurriedness everyone seems to be in back at home on the roads. If you happen to live in an idllyic town on Prince Edward Island, then maybe you’re exempt from all this, but if you live in a suburb of a major North American city, and have battled your share of Friday evening commutes, you’ll know what I’m talking about. Don’t get me wrong. I like driving – I enjoy working on my car, and subtly tuning its performance, handling, and ride comfort. I used to drive a lot. I then moved into the city and starting cycling instead, while only getting behind the driver’s wheel once or twice a week. The switch made the many pitfalls of driving glaringly obvious. After all, short or tall, man or woman, the car is the great equalizer. Driving empowerment seems to turn mild-natured folk into road-raging predators. Normal, benign personalities manifest into unconscious behaviour behind the wheel: impatience, aggressiveness, revenge, control, judgments superiority complexes, uttering profanities, and intimidation of others. If you have to deal with these temperaments once or twice a day, then here are some tips on how to get most of your time spent on the roads. 1. Practice patience. Patience is one of the great virtues that will bring plenty of peace into your life. 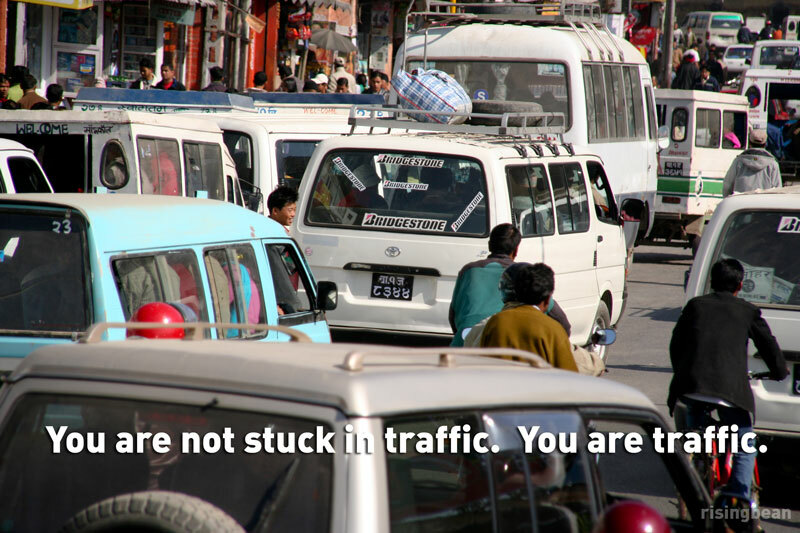 Patience brings you into the present moment and helps you shed the insanity of daily driving. Turn off the news on the radio, don’t think about what you have to do or how long the drive is taking, let other drivers merge, and just enjoy the moment. If the air quality isn’t too bad, crack open the window and take in some nice, deep breaths. If you’re in a hurry to get somewhere, take notice of your urgency, and how it potentially can turn into dangerous driving. Relax and try to drive as you normally would. Is the driver in front of you too slow? There’s no need to tailgate. Give yourself some space – it’s better for accelerating into a pass, easier to spot oncoming traffic on 2-way roads, and most of all, less taxing on your mental health. Likewise, swerving and rapidly changing lanes in traffic actually won’t likely save you any significant time and actually contributes to traffic jams. 2. Make driving a meditation. Continuing on the last point, enjoy the drive or be at peace with the moment, even if you’re in bumper-to-bumper to traffic. Meditation doesn’t necessarily mean closing your eyes, humming mantras, or listening to hypnotic audio tracks – those are one-way tickets to a serious accident. It’s more like taking thoughts as they come – negative ones, listing to-do tasks, or just the general non-stop ranting – and releasing those thoughts. You can’t free up a traffic jam, so let go of any controlling behaviour, put your focus just on driving, and don’t pre-occupy your mind with anything else. 3. Learn on the road. I’ve learned the basics of Spanish, Mandarin Chinese, and Japanese on the roads through audiobooks. I’ve also learned a thing or two on how to pick up women, start a business, and creating great habits. Audiobooks are a great way to kill the monotony of a traffic jam. At other times, I may get a great blog or dance idea and dictate my thoughts onto my phone via the voice recording application. I know that sometimes your brain turns off, especially at the end of a long work day, and it’s really hard to concentrate on learning. In that case, there’s no point in risking falling asleep on the roads. Put on audio programs that actually engage you or just sing along with some music you like. Just avoid non-traffic related news. 4. You are not the better driver. Fact: 80% of drivers think they’re above average. Unfortunately, the math doesn’t work out. Likewise, because a 4WD SUV can roar to life and theoretically crush all surrounding compact sedans, it doesn’t make the driver the sultan of the roads. Assume you’re an average driver like everyone else and drive defensively. 5. NEVER look at the other driver (unless to say something nice). I really need to emphasize this fact. I know it’s really tempting to see who that *&%$#@ who wronged you on the road is, but really think about it. There’s NOTHING to be gained except for making judgments on the other driver’s race, gender, age, or lackluster taste in Hawaiian shirts. It’s unnecessarily confrontational, creates bad energy, and you don’t want to go down that road (no pun intended). 6. Reduce your time on the roads. If you can move closer to work, or somewhere that allows you to switch to public transportation, then do it. You can write off the expenses too if you’ve moved a substanial enough distance (usually 20 km/12.5 mi). I’ve done it in the past, and it was really worthwhile in terms of the time savings and mental health benefits. You are not better than the other drivers, as a person. That’s it. Even if you have had no accidents, know the back roads better than you know how to dance Gangnam style :), or can stick-shift drive a semi through a Himalayan mountain pass, your driving skills and know-how actually don’t make you a better person. You might be the more experienced driver, but even then, don’t let that get to your head. In the meantime, drive safe and peacefully!